BBC VR Hub is bringing two new virtual reality experiences to this year's Venice Film Festival: Berlin Blitz and Make Noise. 1943: Berlin Blitz celebrates the 100th anniversary of the RAF by putting you in the shoes of BBC correspondent Wynford Vaughan-Thomas, who flew with a Lancaster bomber crew during World War II to give radio listeners an insight into a real bombing raid. The virtual experience, created in collaboration with Immersive VR Education, uses Vaughan-Thomas's original radio broadcast, bringing his words to life by recreating exactly what he saw and felt during the flight over Berlin. 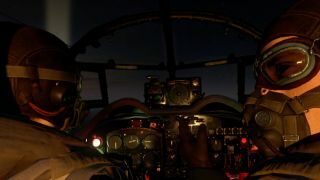 Moments after slipping on an Oculus Go headset, participants find themselves seated right in the middle of the plane, surrounded by its crew as it flies over city, avoiding searchlights and bursts of anti-aircraft fire before releasing the bomber's payload and returning to Britain. 1943: Berlin Blitz will premiere together with Make Noise – a celebration of the British suffragettes, who spoke up for women's right to vote a century ago. The experience uses novel voice technology, encouraging users to speak, shout and sing to interact with the virtual environment. Saying the names of women who inspire you blows washing off a line (signifying release from a life of domestic chores), and humming a note creates towering, colorful statues of women who fought to make themselves heard. Make Noise uses archive recordings from suffragettes recalling their experiences, brought to life with bright, abstract and sometimes surreal animations. "BBC VR Hub exists to excite audiences by creating the most enthralling experiences imaginable using the power of VR, and both of these do that, but in very different ways," said Zillah Watson, head of BBC VR Hub. "Make Noise uses voice technology in an innovative way to put you in the shoes of the suffragettes, encouraging you to follow their example and use your voice to change your world. It’s empowering, profound and yet playful, and a great example of why we should follow Emmeline Pankhurst’s advice and 'make more noise'." Despite being the oldest event of its type, the Venice Film Festival is fully embracing virtual reality, and has dedicated an entire island to the medium. Lazzaretto Vecchio, just 50 meters from Venice Lido, is a small, uninhabited island that once served as a leper colony. There were plans to convert its old, imposing hospital into a museum of archaeology, but the historic building has now found a new use as a VR gallery that lets visitors truly disconnect from the real world.